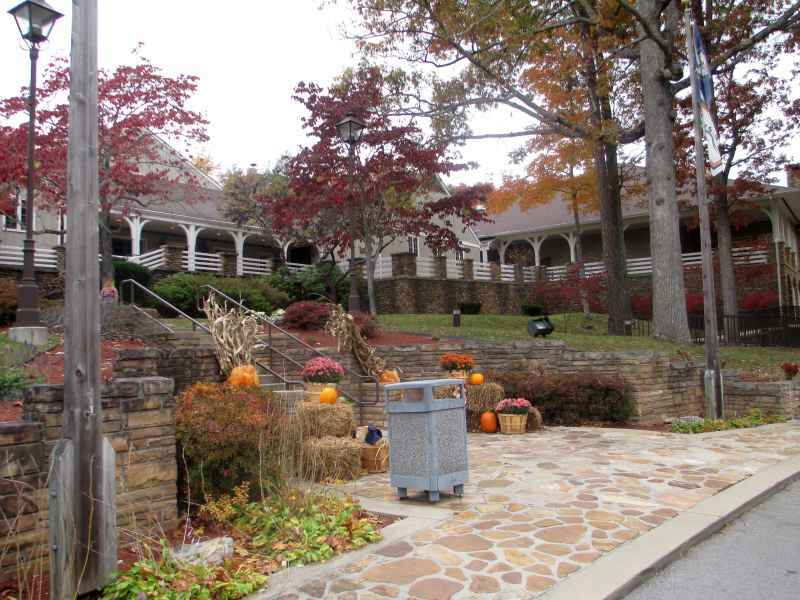 Pine Mountain State Resort Park: The Hills Will Be Alive With Music! Although this event has expired, there is always something to see and do in Kentucky. Visit our Kentucky Events page for up to the minute happenings and be sure to check out our Things to Do in Kentucky page. Keep an eye out for information on Genuine Kentucky about the 2015 Dulcimer Convention! If you’re presented with ANY reason whatsoever to visit Pine Mountain State Resort Park, you should jump at the chance. This is one of the most scenic and gorgeous places in the entire country. It’s beautiful, year round, but when you’re there in Autumn, you simply do not want to leave. If you love music – especially bluegrass music, the information below will give you a perfect chance to visit this incredibly beautiful Kentucky State Park. Dulcimer players from far and near will gather Sept. 26-27 at Pine Mountain State Resort Park at Pineville for a music festival devoted to dulcimers – the 2014 Great American Dulcimer Convention. The Appalachian dulcimer is a sweet-sounding string instrument played on the lap. Similarly named but unrelated is the many-stringed hammered dulcimer, which dates back to ancient times. Both types are spotlighted in the convention’s concerts by professional musicians and in workshops, open stage opportunities and jams open to all. This year’s returning performers include Kentuckians Anne MacFie, a songwriter and balladeer, who organizes the festival; and multi-instrumentalist Randy Wilson, as well as mountain dulcimer champion Gary Gallier of Springfield, Missouri. Making their first performance at Pine Mountain are Steve and Ruth Smith, a hammered dulcimer-banjo duo from North Carolina; Square Thirteen, an Ohio band featuring the mountain dulcimer of Laura Elder; and from Rhode Island, Aubrey Atwater and Elwood Donnelly, a husband/wife duo excelling in singing, folk dancing and playing an array of instruments. Convention activities begin with an 8 p.m. Friday evening (Sept. 26) concert by all six acts. Saturday morning (Sept. 27), the performers teach mountain and hammered dulcimer classes at beginning, intermediate and advanced levels. Afternoon activities include a group jam, open stage for dulcimer players, learning workshops and informal performances. The event winds up with a Saturday evening concert. See more pictures of Pine Mountain State Resort Park in our photo galleries! People (me, included) throw the words “breathtakingly beautiful” around pretty loosely, but Pine Mountain and Pine Mountain State Resort Park serve as reminder what the words really mean. Bluegrass Through the Years Benefit Concert Buy Your Tickets Online! Loving bluegrass music isn’t just a passion in Kentucky, it’s kind of a birthright. I’m pretty sure those of us who were born here had an appreciation for banjo music when we were a day old. Even those who aren’t born here learn to love bluegrass music soon enough. Heck, if they don’t, we ask them to leave. Kidding aside (and I promise I was), I wanted to let you know about something that’s doubly exciting. “Doubly” because you have the opportunity to enjoy outstanding entertainment while doing your part to improve the lives of other’s. The Bluegrass Through the Years Benefit Concert on September 29, 2012 at the Mountain Arts Center in Prestonsburg, KY. will benefit Good Shepherd Community Nursing Center in Phelps, KY and Cedar Creek Assisted Living Community in Pikeville, KY. Both communities are part of the ministry of Presbyterian Homes and Services of Kentucky, Inc. PHSK helps provide services for those who may not be able otherwise afford care. PHSK will never turn anyone away based on financial difficulty and relies on donations to be able to do so. I just have to interrupt myself for a second and give a great big “cyber hug” to anyone and everyone who devotes their lives to helping those who can’t fully support themselves. Thanks to God above for good Samaritans and people who walk the walk in addition to talking the talk. I respect you to the ends of the earth and back. I believe there’s a special place in Heaven for people who help other’s. 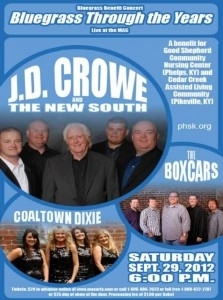 Appearing at this very worthwhile Bluegrass Benefit will be legendary banjo player JD Crowe, IBM award winning band, The Box Cars and local favorites Coaltown Dixie. Coaltown Dixie… now is that a great name or what?! You can help PHSK by making a donation or purchasing tickets to the benefit concert.Ã?Â Either way you’ll be walking in the footsteps of heroes. Music fans, check out the Mountain Arts Center homepage for more upcoming events. Man, oh man, I love that banjo! A Pickin’ Party at The Homeplace in Land Between the Lakes! 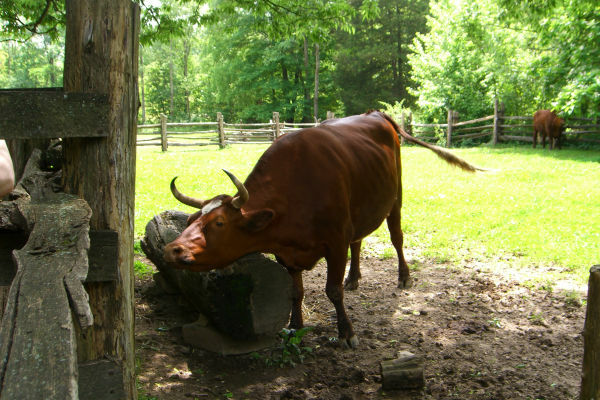 The beautiful ox above is one of The Homeplace’s prized residents. There’s nothing about the Land Between the Lakes that I don’t love. An animal lover since before I was even born – don’t ask how I know, I just do – I love the Nature Station, the Bison and Elk Prairie, and the endless opportunities to see birds, butterflies, and wildlife. Another identifying trait of mine is the fact that I’m a huge history buff. Given that The Homeplace has animals and oozes history means it’s a place I can never get enough of. The Homeplace is, essentially, a step back in time. Located in the Tennessee portion of Land Between the Lakes, The Homeplace is as educational as it is entertaining. There’s also an outstanding gift shop that has just about everything you could hope for from a gift shop. To read more about The Homeplace and its history, please click the link. A Pickin’ Party on the Horizon! Anytime The Homeplace hosts a party, it’s one for the books and, trust me, when there’s food involved, you’ll want to invite everyone you know. The food is always positively mind-boggling – as delicious as food can possibly be. As you’ll notice in the blurb below, food will be available for purchase (insert a BOO-YAH right about here). The Pickin’ Party will be in full swing (literally) on Saturday, May 28 and Sunday, May 29. From LBL.org: Born of the heartland, raised in the river valleys, old-time country music this weekend will once again echo in the hills and hollows of LBL. For two days, experience the best of old-time music through workshops, pickin’ sessions, and energized performances of old-time fiddle, banjo, and bluegrass music. Bring your banjo, guitar, fiddle, or harmonica and join in on the fun during daily open mic sessions. Enjoy weekend performances of folk singer and fretless banjo picker, Mark Dvorak, old time string band, The Dixie Volunteers and Cumberland River Plow Boys, Celtic music by Red River Breeze and the best of old time and bluegrass music. Throughout the day, stroll through the historic buildings, fields and gardens, and talk with the 1850’s farm family as they go about their daily chores. 1850’s children’s activities will be provided throughout the weekend.Festival food and ice-cold drinks will be available for purchase. Bring lawn chairs or ground blankets. Saturday-Adults $6/Children $4; Sunday-Adults $5/Children $3. Includes same day HP admission. For more information, call 931-232-6457. Click HERE for performer’s descriptions and schedule.